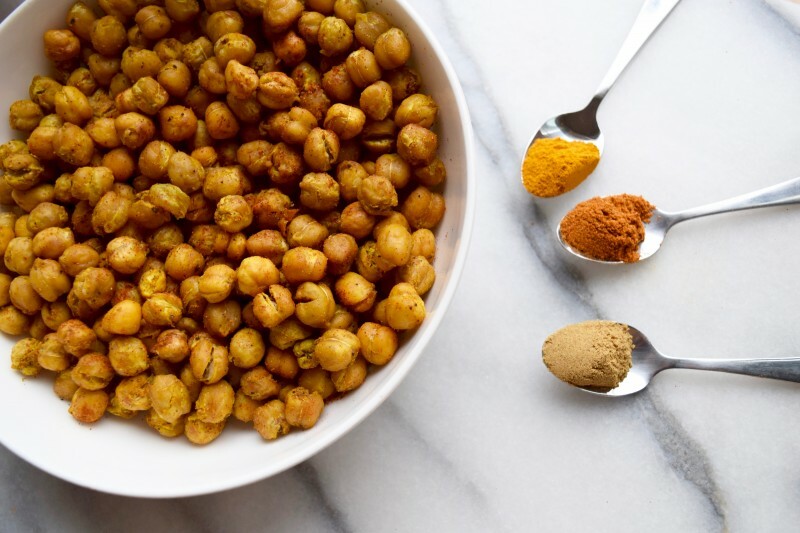 Made with a fragrant blend of spices and perfectly crispy, these chickpeas double as a snack and “croutons” to be thrown on a salad. In the meantime, here are a few excerpts from The Real Food Grocery Guide and The Real Food Guide to Spices & Superfoods. 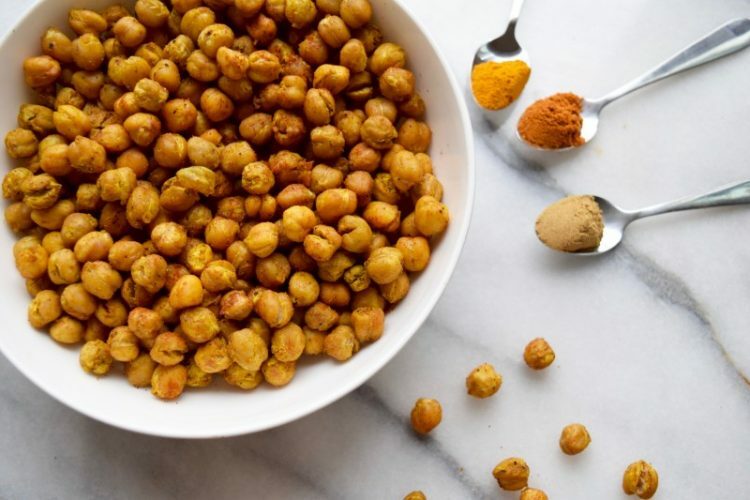 Chickpeas: Chickpeas are particularly beneficial for digestive health because they consist of up to 75% insoluble fiber. They’re also a top source of antioxidants, which slow and prevent cell damage, effectively slowing aging and disease. Turmeric: Turmeric is a powerful spice that exhibits anti-inflammatory, antiviral, antibacterial, antifungal, and anticancer activity. It has been found to help protect against many diseases, such as diabetes, arthritis, Alzheimer’s, and other chronic illnesses. Cayenne: Cayenne is a dried, powdered pepper that can be used to add medium heat to any dish. All hot peppers contain capsaicin, which boosts metabolism, decreases appetite, and increases fat burn. Pink or Celtic Salt: Sodium, when consumed in moderation, helps our bodies conduct nerve impulses, contract and relax muscles, and maintain the proper balance of water and minerals. Unrefined salts like pink or Celtic salt are not heavily processed, so they contain less sodium and more minerals. Black Pepper: Black pepper improves digestion, promotes intestinal health, and has antioxidant properties. For the best flavor and nutritive qualities, use whole black peppercorns in a mill and grind over a dish just before serving. I love them either on top of this Smashed Kale and Avocado Salad or right out of the bowl.